> WE'RE PROUD OF OUR AWARDS AND STYLISTS! VISIT OUR CONVENIENT LOCATION IN FARMINGTON! Click the photographs for maps and salon locations. 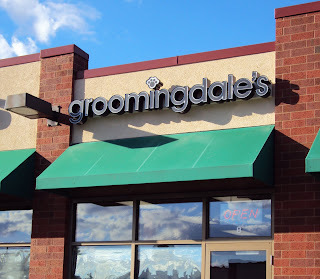 Welcome to the online home of Groomingdale's Pet Salons of Minnesota! We have been grooming the best looking pets of the Minneapolis-St. Paul South Metro area since 1988. We are proud to be family owned and operated. We would love to help your pet to look their best. Please call one of our convenient south metro locations in Farmington or Eagan to schedule an appointment today! We look forward to seeing you and your pet! We groom cats in Farmington! Now proudly serving the cities and surrounding areas of Burnsville, Eagan, Apple Valley, Savage, Prior Lake, Edina, Eden Prairie, Farmington, Northfield, Lakeville, Bloomington, Inver Grove Heights, Rosemount, Shakopee, Richfield, New Market, Elko, Mendota Heights, Hastings, Red Wing, Minneapolis and St. Paul, Minnesota.